Hi friends ! how are you ? Hope you are fine. Today I am here with a new lesson name How To Create Web Page Table By Html. 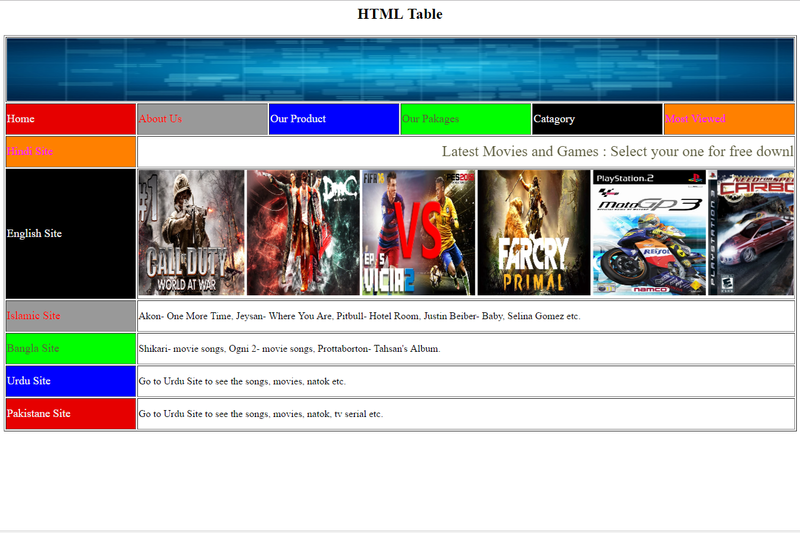 With this post you’ll learn How To Create Web Page Table By Html. This lesson is about how to change background image, font color, font size etc. So friends, let’s see how it work. Latest Movies and Games : Select your one for free download. Shikari- movie songs, Ogni 2- movie songs, Prottaborton- Tahsan’s Album. Go to Urdu Site to see the songs, movies, natok etc. Go to Urdu Site to see the songs, movies, natok, tv serial etc. After all these codes are complete you can see the following table on your webpage. Web Page Table So what are you thinking for ? Create your won webpage table with these html codes. Till our new lesson be well.